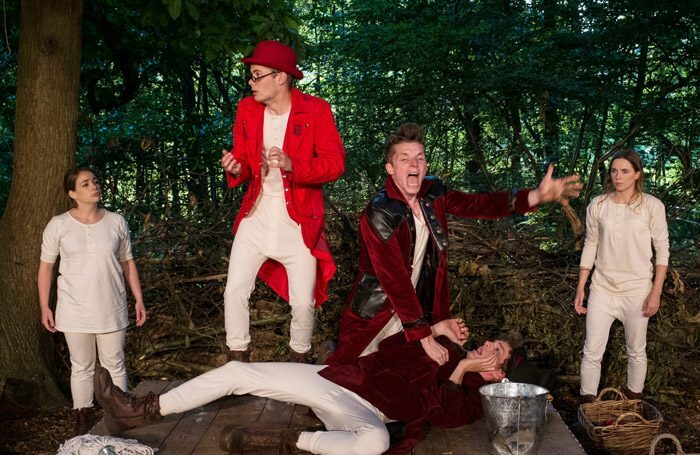 Red Rose Chain’s As You Like It sees the company return to the atmospheric outdoor forest setting at Jimmy’s Farm. It’s an energetic, clever and irreverent production featuring music, dance – and Mexican wrestling. There’s audience participation and lots of off-text banter. The cast of five actor musicians weave in and out of tents, the audience and a cute cottage with its own smoking chimney. The Forest of Arden is relocated across the Atlantic to rural USA. Cowboy sing-song accents twang and there are some splendid moustaches. Jo Carrick’s interpretation playfully parodies this uber masculine world, and uses it to emphasise ideas about sexuality and gender – everyone gets a go at cross dressing in this show. The family-friendly production keeps younger members engaged completely via sing-along numbers and water-throwing as well as inventive staging and use of space. A small raised stage, draped with banner reading “All the World” perfectly frames Oliver’s retelling of Orlando’s fight with the lion accompanied by a live soundtrack of the music from Jaws and Eye of the Tiger. Jacques’ seven-ages-of man speech is performed to country music and, as sung by Emma Swan, it is a comic highlight of the night. The cast work tightly as an ensemble. Darren Latham’s music hall style repartee is strong and Jack Heydon is impressively versatile both vocally and physically. Fizz Waller is a warm, witty and swaggering Rosalind who has real chemistry with Ryan Penny’s sweetly earnest Orlando.